A well-designed toilet will do its job day in and day out, for year after year, but when things do go wrong with a toilet, the problem becomes very noticeable. Even if your toilet is still functioning properly, you may be considering replacing it to cut down on water bills or . If your toilet needs repair, Master Plumbing & Mechanical can quickly and efficiently correct the problem, or help you select the right replacement toilet for your home. Just because a toilet is still functioning and has not become fully disabled does not mean that it might not still need to be repaired. If a toilet frequently clogs, continually runs when not in use, leaks, or lacks flushing power, Master Plumbing & Mechanical can get it back running at maximum efficiency. Clogs: Anyone can identify with the panicked feeling of watching the water level in a toilet quickly rise when a clog obstructs the drain. Occasional clogs could be the result of excessive toilet paper or a foreign object in the bowl, but a toilet that clogs frequently could be in need of repair. Running toilets: There could be many reasons that a toilet continually runs, but the bottom line is that a running toilet can waste up to 200 gallons of water a day, and needs to be repaired immediately. 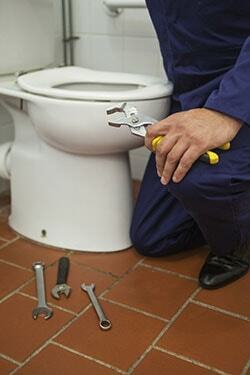 We can assess the problem and replace any parts that may be to blame for constantly running toilets. Recent advances in toilet technology have made modern bathrooms even more comfortable and functional. If your toilet was manufactured before 1994, then it’s likely costing you money every day. New toilets use almost two gallons less per flush while offering the same or better flushing power as their outdated counterparts. Whether you’re looking for a standard toilet from a dependable brand or a newer style with modern features, Master Plumbing & Mechanical can help you choose the right toilet for your needs and perform a professional installation. Comfort height toilets: Sitting on a toilet for extended periods of time can be bad for the back or knees. New toilets that feature spacious, higher seats feel more like sitting in a chair, and are easier to sit on and stand up from, while also offering improved efficiency. Dual flush toilets: When it comes to toilets, one flush does not fit all situations. New dual flush toilets allow a one-gallon flush for liquid waste and a 1.5-gallon flush for solid waste all in the same handle. When just the right amount of water is used to flush, families can save significantly on their water bill over the course of a year. Having honed its craft in the plumbing fixtures trade for more than 130 years, Kohler has a legacy unparalleled in the industry. For almost 100 years, Toto has stayed true to its rich heritage in the fixture business. Gerber offers toilets and fixture to meet competitive pricing without losing quality. Master Plumbing & Mechanical services the Washington, D.C. metropolitan area. For toilet repair or replacement, contact us to schedule a consultation.